A major route into Birmingham was closed to traffic after a lorry burst “into a ball of flames” following a crash. The HGV lorry collided with a car in the Dartmouth Circus on the A38 Aston Expressway just after 2pm on Tuesday. 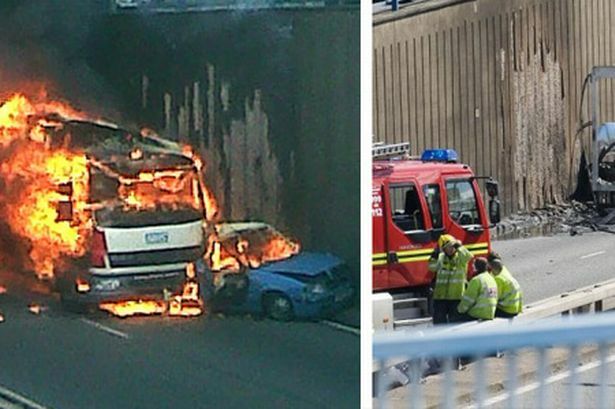 The lorry then burst into flames, but both drivers escaped without serious injury. Fifteen fire fighters were sent to the scene to tackle the fire, and West Midlands Police closed a stretch of the Expressway in both directions while recovery work was carried out. Eyewitness Anthony Greenshields, who was heading back to his home in Erdington on his motorbike, described seeing a “ball of flames” in the minutes after the crash. The 39-year-old said: “It was about five past two when I was riding down in the opposite direction. “I could see thick smoke coming from the other side, so I pulled my bike over and rang 999. He took the photograph above of the lorry and car in flames. The Expressway was closed inbound from Park Circus and outbound from Dartmouth Circus. A police spokesman said: “It is a small stretch that has been closed but it is very busy there at the moment. Firefighters from Ward End, Ladywood and Handsworth fire stations attended the scene.